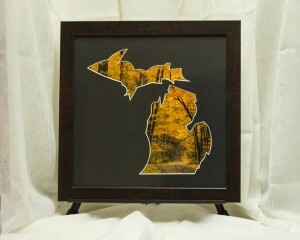 This unique Michigan framed art is perfect for anyone who loves this great state and would make a great gift for your friend or loved one who has moved away and misses it. Click the image for more information on the product and ordering information. Unique Framed Art. Beach stones in custom mat & frame. Petoskeys and agate. Original home decor or photo gift. moved away and misses this amazing state. This all custom piece measures 16″ wide including the frame, which is dark walnut in color. The mat is black with a white core. The image and mat size are 14×14 inches. Photo is mounted on acid-free backing board and then finished with acid-free foam core. It is pre-wired for hanging. A dust cover is recommended after you receive it. One of a kind Michigan framed art piece. Autumn leaves, fall scene. Custom mat and frame. Unique home decor. Great photo gift. state as much as I do. This custom item measures 16×16 inches including the frame. The mat is 14×14 inches in size and the frame is dark walnut in color. The photo is adhered to acid-free backing board and then finished with a backing of foam core. A dust cover is recommended after you receive this unique Michigan art. Hanging wire is already installed, as well as wall bumpers for cushioning. 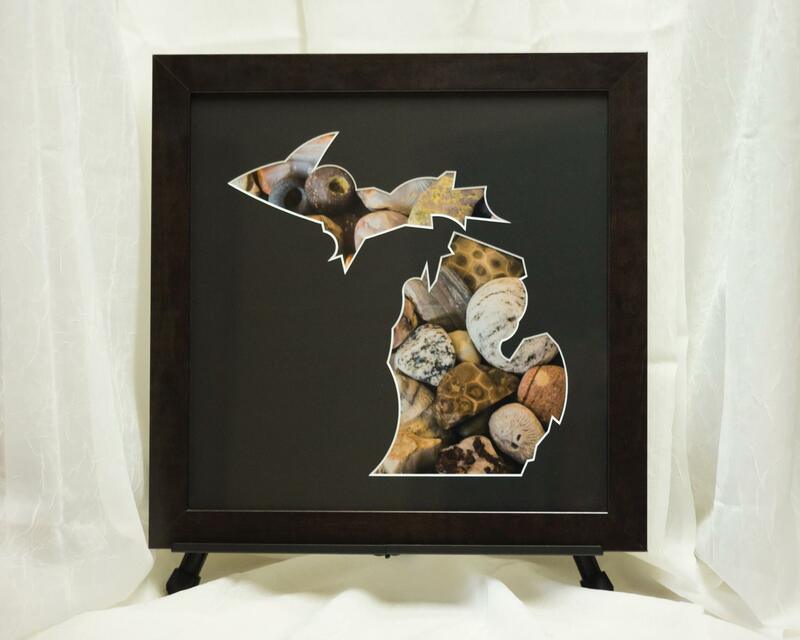 Awesome and unique Michigan art. Fall color scene in custom mat and frame. Autumn leaves. One of a kind home decor. 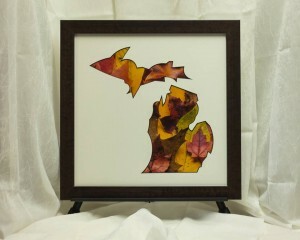 This gorgeous fall color scene in a custom shaped mat is ready to hang in your home. It would also make a great gift for anyone you know who loves or misses our amazing state. This item measures 16×16 inches including the frame. The custom mat is black with a white core. The photo is mounted on acid-free backing board then finished with foam core. A dust cover is recommended once you receive it. The frame is dark walnut in color. It is already wired for hanging and has wall bumpers as well. It just needs a new spot to call home!